Since I’m now having to rush myself to get these trip reports finished (as I keep saying!) before our next trip, they are really going to be minimal, with just a few photos of what we did, and details about our Deluxe Disney Dining Plan experience. I wish I had more time to get these done, but I don’t, and I’d rather have something on my blog than nothing at all – I hate leaving things half finished! All photos from this day can be found on my Flickr account here if you’d like to see more from Day 10 of Halloween in the Wilderness 2015. Today was a non-park day, with lunch at Trail’s End at Disney’s Fort Wilderness Resort & Campground, followed by miniature golf at Winter Summerland, and wrapping up the day with an evening at Downtown Disney and dinner at the new BOATHOUSE. Instead of driving to Fort Wilderness, we took the inter-resort bus from Wilderness Lodge. This goes “round the back” as it were, and not on the public roads. We only realised this bus service when we went to watch Hoop-Dee-Doo a few days before. It’s very handy, because when you drive to Fort Wilderness you have to park your car, and then catch a bus to the Settlement where the restaurants are. We had an early lunch booked, one of the first to be seated for this meal time, as there were still people inside having breakfast. Our server was a bit on the weird side I have to say, she kept getting our order wrong when repeating it back to us, and on the whole the service wasn’t much to live up to. We were able to tick a few things of our “must eat foods in America list” in the form of fried green tomatoes, a po’ boy, and catfish. Steve has been wanting to try catfish since our first trip in 2011! The food was good, but I am not sure if we would bother to go here again. After paying the bill, we had a look at the horses at Tri-Circle-D Ranch, before catching the bus back to Wilderness Lodge. We picked up our car, and drove to Winter Summerland for a round of miniature golf. We’ve been here before, and played the winter course, so this time it was the summer course for us. We had a lot of fun, and just like last time, there were not many people playing, so we didn’t feel like we had to rush our way around the 18 holes. I’m not sure what we did after playing golf – we may well have just hung out back at the resort, or gone shopping or something. But for dinner at The BOATHOUSE, we caught a bus to Disney Springs to save faffing about with the roadworks that was still going on around there. Thankfully, quite a few of the hoardings which were present on our last trip had come down so it didn’t feel so claustrophobic down. The new area with looked very good. It was bustling with people, a band was playing, and all around it was a great atmosphere. We checked in for our late reservation (close to 9pm), and whilst waiting watched as one of the Amphicars launched into the water. The BOATHOUSE is brand new, and as such I’d not read too much about it before we went. Because we were on the Deluxe Disney Dining Plan, it made sense to try it out any way, because as a signature restaurant it meant it cost 2 credits per person to dine here. The restaurant itself was themed well, with a drinks bar, and raw bar, a pianist playing in one corner, and nautical themed decor. The restaurant was also very loud. Probably the loudest I’ve ever been in. A combination of the music, the general hustle and bustle, and people talking (loudly over the music! ), so be forewarned if this is not your thing. We were shown to our table which was in the back room – away from the bar; but it was still very noisy, and still very busy for a late reservation – clearly a popular place. We were given a basket of bread, and our server introduced himself. Liam was wearing his West Ham shirt, and it turned out the server was also a Hammers fan, so that sparked a chat between him and the boy. The menu was huge, and it took quite a while deciding what to have. The service okay, but it did get a bit slapdash at times with things being forgotten like drinks refills, and a side order we had. Ultimately, the service started very well, but as the restaurant got busier, the service dipped. I know it is (was?) a new establishment, and it felt very much like that, often feeling like the staff were running around like headless chickens. Personally, I’m not convinced its worthy of signature status compared with others we have dined at, and I don’t think we would dine here again unless we had the dining plan. Overall the food was good, but I made bad choices I think. In my head, I thought the lobster cocktail was going to be like one of our 70s prawn cocktails, but it wasn’t. It was literally half a lobster on ice! Not a problem as I love lobster, but not what I thought it was! For main meal, we really couldn’t decided. I think we both wanted a surf ‘n’ turf, so the server suggested, to get the most for our credits, to order the 12oz filet mignon, and a stuffed lobster and share that. Which was all good and well, but the faff trying to share that between the two of us on a small table was, well, faff. Plus we had to order fries on the side, as it didn’t come with any potatoes, and for some reason I was craving them fries! My dessert was horrible. Sorry to say. I had read that it was “really nice” so ordered it, but nope, not to my taste buds. Liam didn’t really want his dessert, and I tried some, but that wasn’t all that either. Steve made a good choice with the cornbread cake. Because drinks had been forgotten, and our side of fries too, we had the fries taken off the bill, so we paid only in DxDDP credits for this meal in the end. After paying the bill, we caught a boat from the dock near The BOATHOUSE, over to the dock where the bus stops are (or used to be, I think they’ve moved now). 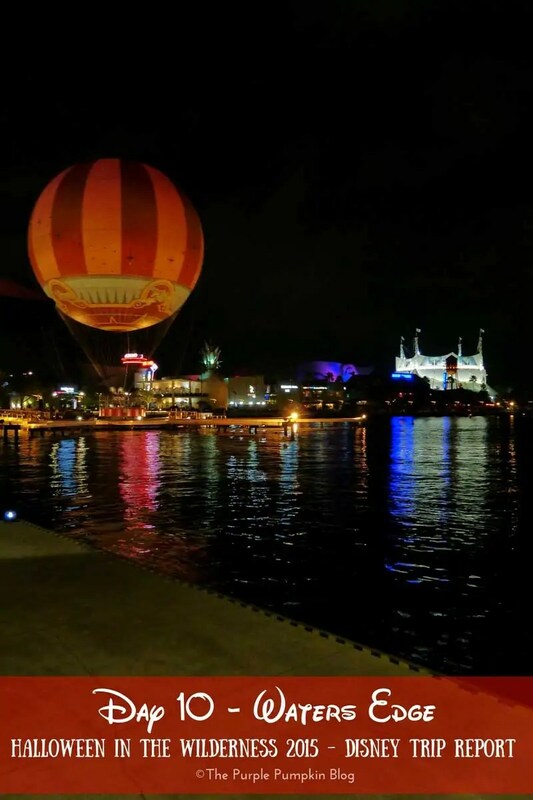 It was nice to cruise on the water at night and see all of Disney Springs lit up. We snuck a quick stop into the Christmas Shop (it was just closing) where I bought some decorations – of course!